Since I'm still new to the Tucson job, it's the first time I've been around for such an event. Apparently this place does potlucks, dubbed "the graze" because people are picking at crap all day, twice a year. The second one, predictably, falls before Christmas. I didn't know the nuances yet: who brought chips, who hogged all the mini-meatballs, what way most people swing whether it be savory or sweet. I didn't have a whole ton of time, either. Finding out on Monday meant all prep would have to be done on Tuesday night after getting home. And I don't know if I've mentioned this, but I am extremely cranky and unmotivated on weeknights. As I am getting way up there in years nowadays, or at least have enough solid years of tenure on my resume to look sort-of-not-stupid at last, I have developed guidelines. Rules, if you will. A few strategies that tend to snag wins at company potlucks. It's not usually a contest... they say. But I'm a competitive contributor. I want to have the dish emptied first, the recipe requested most, and most of all I am a clone of every other writer you'll meet. I have a pathological need to be loved. 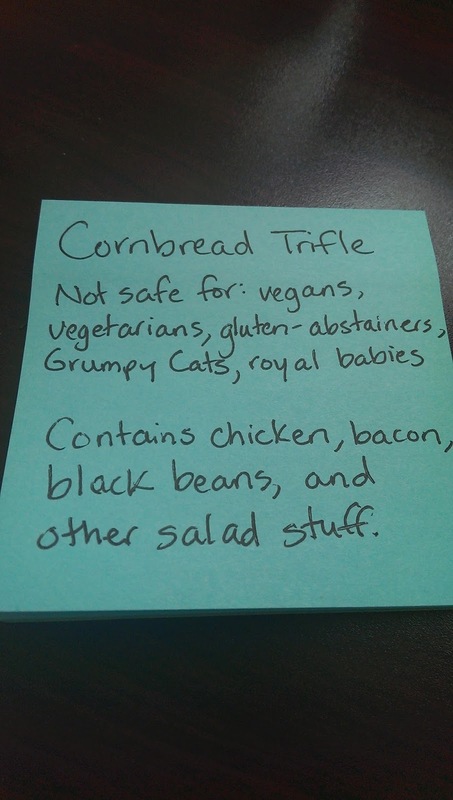 My selection of a Cornbread Trifle, a colorful cool salad served in the old trusty trifle bowl, can be understood by following these important rules. 1. Go cold or room-temperature. I found a really neat recipe on Pinterest for Tamale Hand Pies. Yeah, you know. One of those adorable things you make in a muffin tin. If you all were coming over for a party at my house, where I could pop these right out of the oven, then they'd be a great choice. But I've only worked in one office with a legit kitchen, and it was a food distribution company. Who knew. I don't care how well you wrap a casserole dish in tinfoil. By the time you get it to your office, people get hungry for lunch and start picking at your dish, it's going to be congealed and gross. The industrious will perhaps microwave their portions, but we all know that's not going to taste an ounce as good as it did when it was fresh. Let it stay fresh by keeping it the fridge or at room temp. The exception would be a great Crock-Pot recipe, but this can be tricky, since you don't have all day to let stuff cook. Plus those things are a bear to lug around. 2. Don't bring pasta salad. Or its modern-day, ever-growing equivalent, quinoa salad. Everybody does. And they're boring. And fail to ever taste great. 3. Bring a dish that doesn't look like Tupperware you bought at a party in 1983. This is supposed to be a party! Or at least a slight diversion to keep shrinking middle-class America from FoxConn levels of despair. Bring your food in something pretty, or at least attractive. It helps with that whole eat-with-your-eyes first concept when you're staring down the buffet line. And everything tastes better when it's not retrieved from an olive green, half-melted plastic trough. 4. Don't you dare lazy out! Yeah, you. The one grabbing that cheap plastic carton of grocery store "cookies" that might as well be whimsically cut cardboard with sprinkles. Or the one bringing that veggie tray with carrot sticks, withered snap peas, and watery ranch dressing. You give everyone putting a half-ounce of effort into this thing a bad trade, and are totes not holding up your end of the bargain as you scoop up our delicious offerings. If you ARE going to buy something pre-made, buy something that has flavor and interest, like those sorbets they sell at Costco served in the hollowed-out fruits. Or an upscale deli salad that doesn't taste like preservatives with a side of soggy noodles. You don't have to be an amazing cook to either create or pick out something appetizing. My friend makes brownies with Ghirardelli chocolate mix. And that stuff is yumTASTIC. 5. Make a fun ingredient posty. With everyone eschewing bread and animals, an ingredient advisory is an unsaid necessity. That doesn't mean you can't be interesting. People get chatty about anything slightly different. So did I win the potluck? I like to think so. Why don't you make a lovely version and see how it goes over. 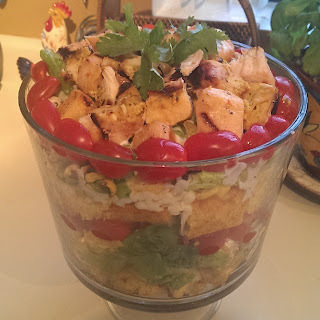 In a trifle or large glass bowl, arrange a solid layer of cornbread chunks. Top first with half of the lettuce, half the black beans, 1/2 cup Ranch dressing, 1/2 cup sharp cheddar cheese, the bacon, 1/2 cup corn kernels, and 1/2 of the chiles. Arrange the halved cherry tomatoes around the top of the layer, as shown in the picture. Add the 2nd layer of cornbread, and the remaining ingredients, topping with the chicken and another row of tomato halves. Garnish with a sprig of cilantro. Chill at least 4 hours before serving, or overnight. Recent reviews by Tabitha B.
Aspiring writer and avid eater doing the only logical thing possible - food blogging. It may not be the most original tale of girl meets Kitchen Aid, but it's definitely the thread that weaves this life and heart together.